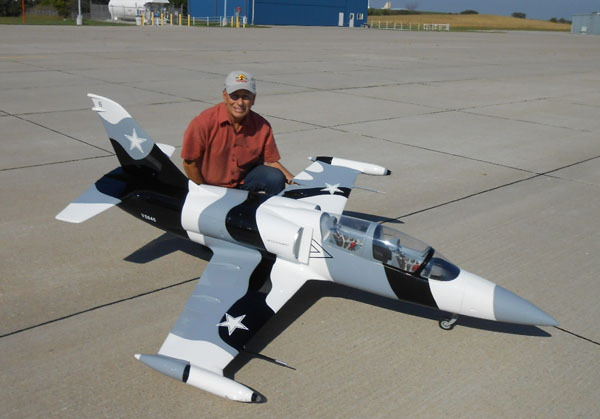 Coming to Top Gun from Omaha, NE., Dean Copeland will be flying his impressive Aero L-39 Albatros. This will be Dean’s 10th year competing at Top Gun, and his first year flying a jet in the Pro Jet class. 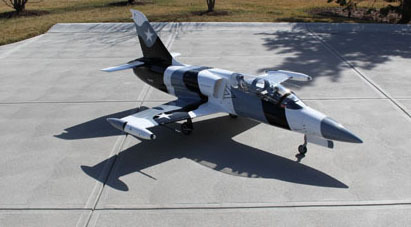 The plane is a BVM 1/5th scale L-39 Albatros, it has a wing span of 74 inches and a length of 94 inches. The Albatros is powered by a Kingtec 140 turbine engine equipped with smoke system and it has a 47.5lbs takeoff weight. painted in the Black Diamond Airshow Team scheme which is based at the Lakeland Linder municipal airport, adjacent to Paradise Field. Dean is still in the process of finishing and detailing the pilot, maintenance nomenclature, etc. Dean is a Team Futaba member and uses a Futaba MZ18 radio system.